Sebastian Vettel lapped the Autodromo Nazionale Monza faster than anyone else during today’s qualifying session, and thereby secured his 40th career pole position, and his Red Bull team’s 50th pole position. Mark Webber completed the front row for Red Bull, and was followed by the unlikely figure of Nico Hulkenberg in third for Sauber. Vettel’s dominance at Red Bull over the last few seasons has been staggering. 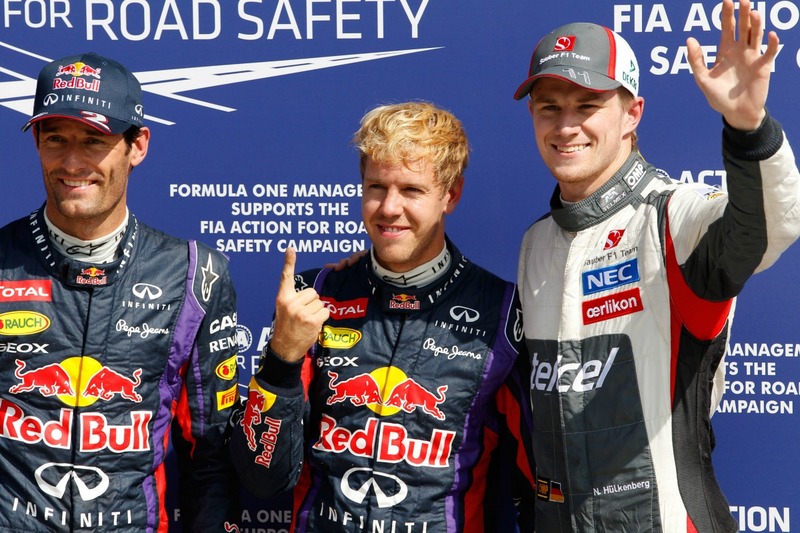 Out of 50 pole positions for the Red Bull team in their short history, Vettel has secured 39. The other 11 have gone to Mark Webber. That’s 39-11 in Vettel’s favour when it comes to pole positions. Not even vaguely close. Interestingly, Vettel now has four pole positions this season and has outqualified Webber at every race so far in 2013, highlighting just how well Vettel is driving during qualifying. Vettel’s speed is clearly not just about the car. He is in imperious form. Mark Webber appears to be much more relaxed after he took the decision earlier in the season to leave Formula One at the end of 2013. Although he missed out on pole position, he appeared quite happy to be starting tomorrow’s race from second on the grid and seemed quite unconcerned about his inability to best Vettel this afternoon. Nico Hulkenberg’s third place in qualifying is his strongest qualifying result since taking pole position at the 2010 Brazilian Grand Prix for Williams. It’s a surprising result, as the 2013 Sauber has not been an impressive car at any stage of the season thus far, and this is only the fourth time Hulkenberg has featured in Q3 in 2013. Hulkenberg has a real chance of delivering a strong points finish from third on the grid, as the Ferrari engine in his Sauber will deliver plenty of straight-line speed and there are very few corners at Monza to highlight the car’s weaknesses. Felipe Massa outqualified Fernando Alonso for only the fourth time this season. The Brazilian was just one hundredth of a second faster than his team-mate, and less than a tenth of a second slower than Hulkenberg in third place. Last year, Massa had a very strong Italian Grand Prix, and he will be hoping to repeat the performance this time round, as it could help him to hold onto his seat at Ferrari beyond the end of the season. Unusually in 2013, the first of the Mercedes drivers is down in sixth position. Nico Rosberg missed out on most of FP3 with an hydraulic problem, and consequently was on the back foot from the start of qualifying. He made the most of a difficult situation and set the sixth fastest time in Q3. In the other Mercedes, however, Lewis Hamilton had his worst qualifying session since 2010, missing out on Q3 after damaging the floor of his car during an off-track excursion in Q2 and failing to find the speed he needed to make it into the top ten as a result. He was also impeded on his final Q2 run by Adrian Sutil, who received a three-place grid penalty for his troubles. Hamilton was not, however, on a particularly quick lap and probably would have been eliminated in Q2 anyway. Toro Rosso drivers Daniel Ricciardo and Jean-Eric Vergne are having a strong home grand prix weekend. Scuderia Toro Rosso is based in Italy, but that is easily forgotten by the home fans who seem to have interest in nothing but Ferrari. However, within the Toro Rosso team there is a determination to deliver strong results at Monza, and the drivers are well placed to do so. Ricciardo will start the Italian Grand Prix from seventh on the grid, with Vergne tenth. Sergio Perez and Jenson Button split the Toro Rossos in qualifying, and will start the race from eighth and ninth on the grid. Monza is a track where the McLaren could deliver good results, despite the team having had a disappointing season thus far. Their Mercedes engines provide plenty of power, which will help them in a straight line and aid overtaking. If they are to have a chance of a podium in 2013, it’s at Monza. Last year the race was won by Lewis Hamilton in a McLaren, and Sergio Perez (who replaced Hamilton at McLaren this season) finished second in a Sauber. Lotus had a qualifying session to forget. Kimi Raikkonen and Romain Grosjean simply did not have the pace to proceed to Q3 and qualified 11th and 13th on merit. They face a long Sunday afternoon in Italy, as the Lotus E21 is simply not suited to the high-speed, low downforce Monza circuit. However, there is the possibility of rain during the race, which could bring the Lotus drivers into contention.